Fishing after work with Heather enjoying the evening and checking out some new fishing spots. I caught a 36, and a 39 inch snook, Heather caught a 33 inch snook and a 30 inch red fish. What a great way to spend the evening catching fish and enjoying life in the Everglades. Steve from Ft. Lauderdale took his dad from Michigan fishing. 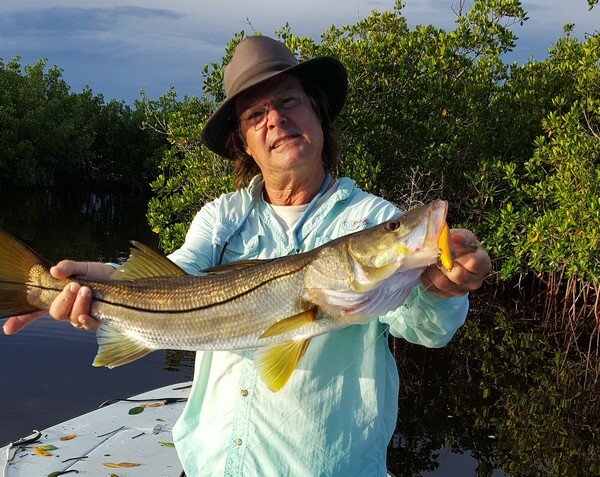 Steve got a nice slot snook first thing in the morning. His goal was to bring home a snook for dinner. We also added some nice trout to the box. 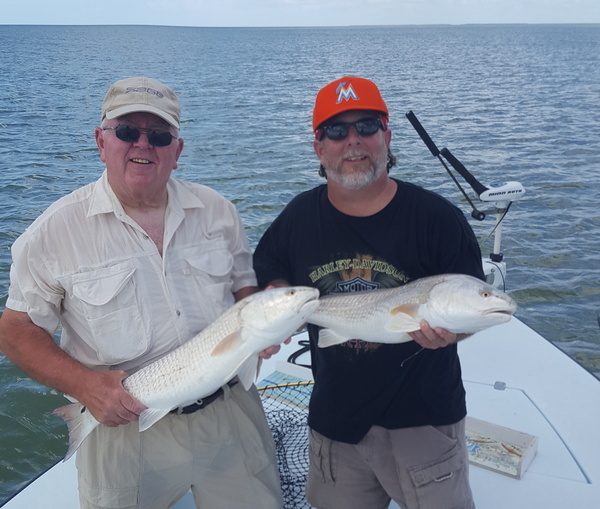 Steve and his father both caught some nice red fish. They were all over slot so they lived to be caught another day. We had a great time catching fish and listening to dads fishing stories. I had the pleasure of fishing with Chad Waligura and his father for the last couple of days. 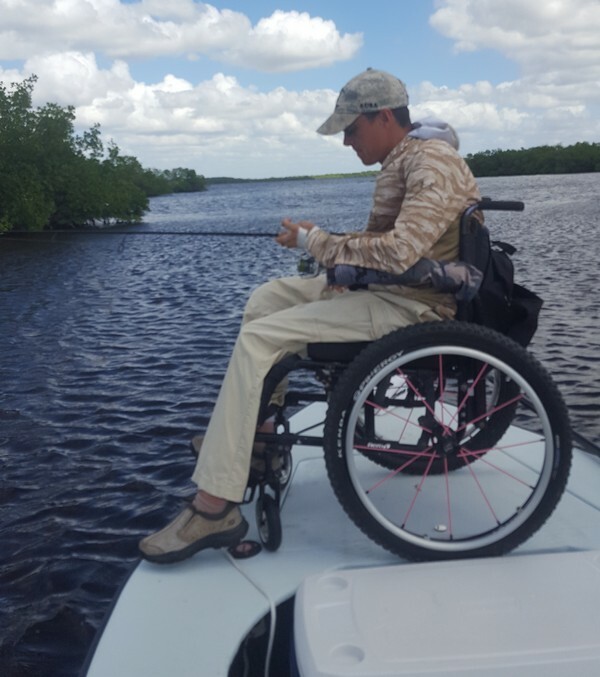 Chad is an avid hunter and fisherman and editor of Able magazine, a magazine dedicated to the mobility impaired hunters and fisherman. It was an inspiration to fish with him. Despite being confined to a chair he has made fishing into an art form . 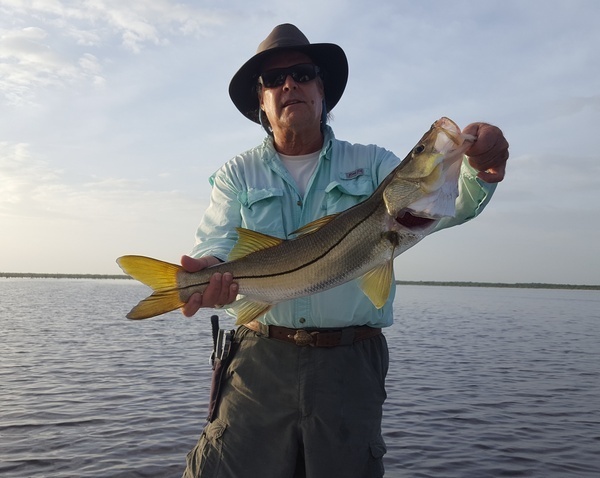 We had a couple of extremely tuff days of snook fishing but managed to catch a few on artificial plugs. We went exploring some new areas deep in Everglades. Got off to a slow start, didn`t catch a game fish till 10:15 am. Once we found them, we caught 49 snook, 3 red fish and 6 tarpon. Kept one snook 32 1/2 inches long that was gill hooked. Had a good opening day of snook season. 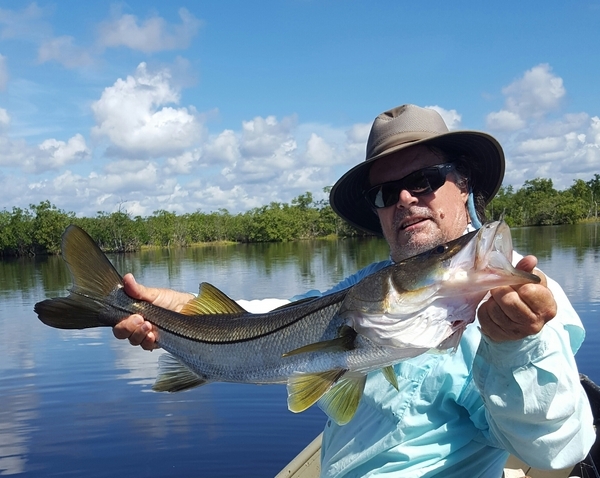 Fished deep in Everglades backcountry caught 13 snook, 3 slot size and 11 red fish on plugs, all released . On the way home we saw an eastern diamond back rattlesnake, was cool to see from a distance. I got to spend my birthday on the bow for a change. This is a pretty rare event and I totally enjoy it. We left Chokoloskee late as we headed shouth towards Highland Beach. I used my fly rod but mainly I used my light spinning rod. 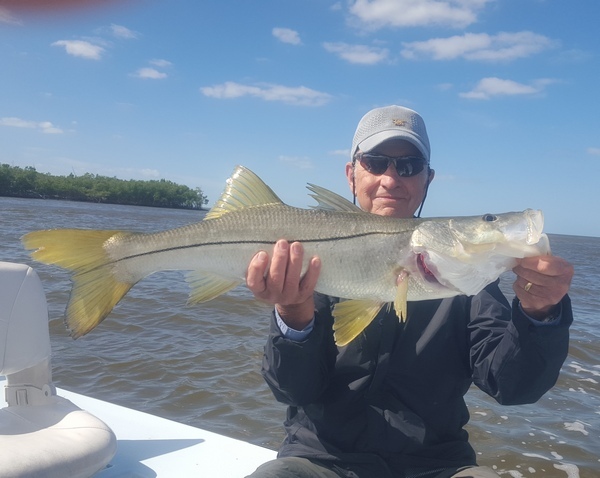 It was a beautiful day on the water, we caught 29 snook and 1 big red fish. Can't think of a better way to spend my birthday. I fished with Abe from Saint Louis he`s 86 years old and has fished around the world. He came here to try to catch a large snook on artificial lure. It was a tuff day to fish with 20+ mph winds but we were successful. We started out fishing on the outside and he got a nice one one his first cast at the mouth of Lostmans river. As the day went on, it became to windy to fish outside so we moved into the back country. We caught another nice one in Two Island bay and some nice trout on plugs. His wife went along for the ride , she was not interested in fishing but she enjoyed seeing the Everglades and its many creatures very much. I enjoyed fishing with them and hearing storys from their world travels, looking forward to their next visit. 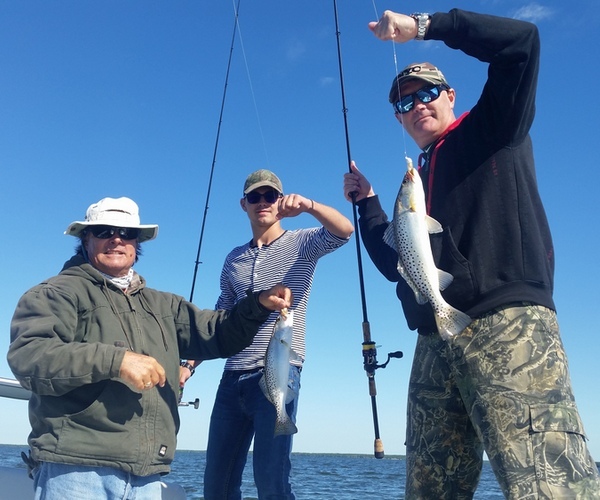 Had a returning client Daniel brought his brother Bob fishing for his birthday. Daniel wanted to show Bob the backcountry and try to catch a tarpon. It was a cold and windy day so we headed deep into the backcountry to a chain of small lakes that have been holding tarpon. The tarpon were there but not in a hurry to hit. We ended up jumping a few and Bob did catch his first tarpon on a plug. 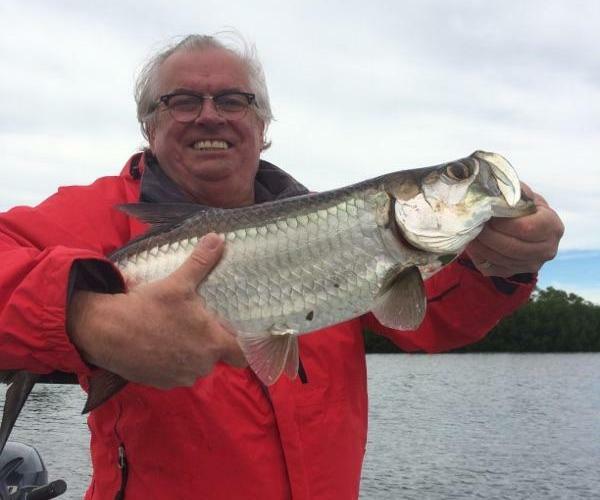 Between catching his first tarpon and our adventure into the deep Everglades backcountry, Bob says its a day he will never forget. Fished with a good client Charlie and his buddy from Pennsylvania. We fished our way down the coast to all the way to Lostman's River. We picked up a couple nice red fish and our limit of nice trout. At the mouth of Lostmans river we saw a large alligator on the shore. Charlie ask me if I ever see crocodiles here in the Everglades. I said yes, I do see them but they are rare and very skittish. By mid afternoon the wind had picked up considerably so we decided to take the Wilderness waterway through the backcountry. 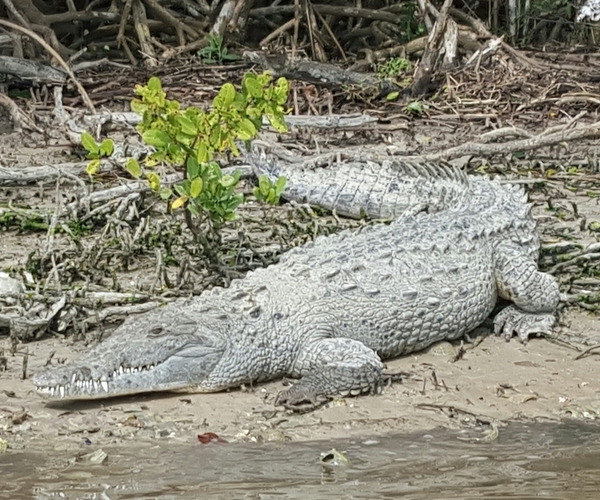 As we went up the river I saw a large crocodile on the shore so we turned around to check it out. It was a cold day so he was in no hurry to leave his warm spot in the sun. We had a pretty good day of fishing and they got to see one of the most elusive animals in the Everglades. Charlie has already booked another trip to take his brother fishing. Had three guys from Romania fishing for the day. Weather was fairly cold but we ran to Lostmans river and had a good morning of fishing. 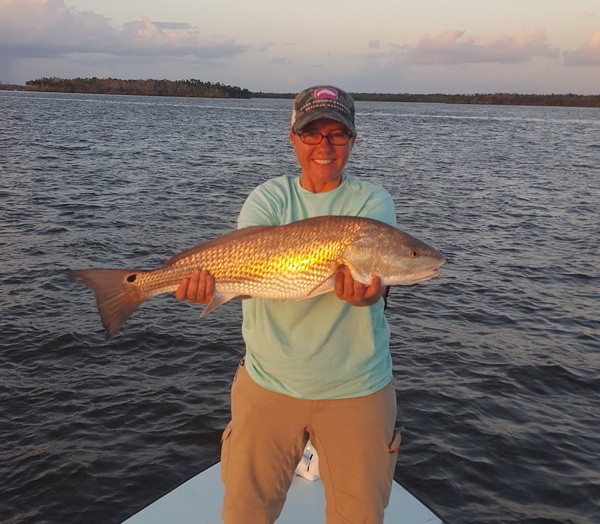 We caught snook, red fish, trout, jacks and ladyfish on plugs. The boys said we want to catch a really big fish so I headed to a shallow wreck just off shore. We caught a large ladyfish and put it on a heavy rod, within minutes we had a 200 lb plus goliath grouper on. We landed it after about 30 minutes took a couple photos and let it go. We hooked four more large goliath groupers and had two more up to the boat. The guys said now that's what I call big fish.